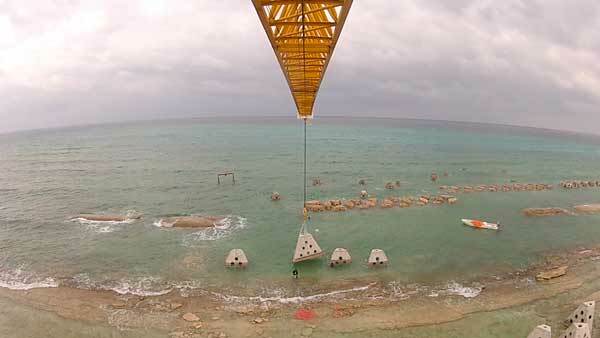 Building the world’s largest artificial reef. Diverting the attention and negative impact of time on the natural ecosystem, and fight against climate changes to preserve the Mexican Caribbean’s splendor, by regenerating the marine ecosystem with an enormous labor. Kan-Kanán is an environmental project never-seen before! It means to turn into the new habitat of thousands of sea species, and will protect the coast from natural erosion. Consisting of a mega project, we currently stand before a fascinatingly interesting solution to a strong problem: the deterioration of marine systems, product of climate changes. This monumental artificial reef will be built using over 1,000 hollow pyramidal structures created on a concrete and micro silica base. Each one of them approximately weighs ten tons, and must be placed with extreme precision over the seabed by very powerful cranes and a team of specialized divers. Its materials and structure make it an environmentally friendly construction that allows nutrients to attach, resulting in the regeneration of marine life. Longer than the Brooklyn Bridge, The Guardian of the Caribbean will cover a 1.9-kilometer area parallel to the coast of Punta Brava. From above, this monumental reef looks like a huge serpent guarding the coast, giving birth to its name: Kan-Kanán, which means “The Guarding Serpent” in Mayan. International organisms and environmentalists originally proposed this new solution, which is in fact built against time. These are merely a few elements that converge in one place and make this project an even more interesting and huge challenge! The project takes place in one of the richest and most diverse ecosystems on the planet: The Caribbean. 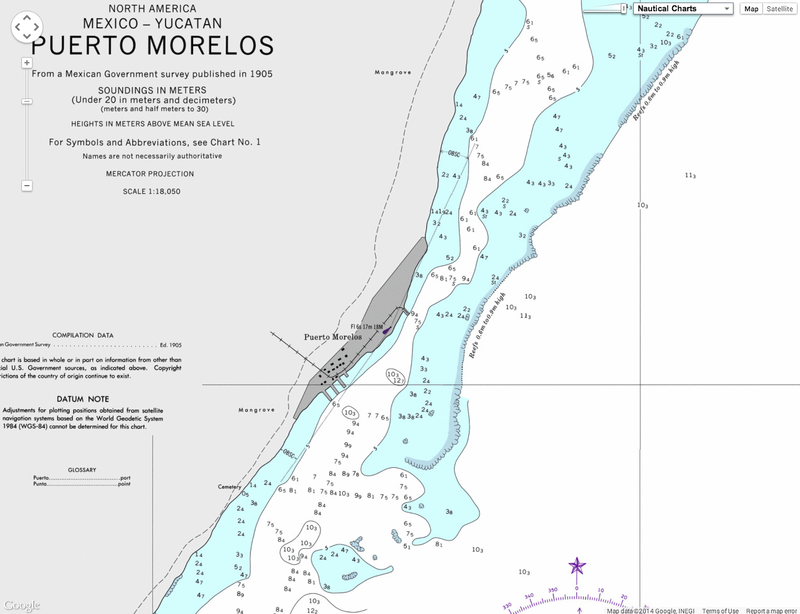 The construction site, located in Puerto Morelos in the state of Quintana Roo, Mexico, is home to over 13,450 marine species, and stands just in front of the world’s second natural coral barrier. In one of the most exotic sceneries in the globe, the effort of more than one hundred people is focused on regenerating one of our most valuable treasures. For centuries, the vaults of the Bodleian Library at the University of Oxford held a map of the South China Sea that both fascinated and confounded sinologists. Note: this image was made after the conservation work. Unusually ornate, it was long considered a curiosity, but only recently has its significance come to light. Interest in the map was ignited in 2008, when a historian from the U.S. visited the Bodleian during a conference trip. Dr. Robert Batchelor, a researcher in early Sino-European relations at Georgia Southern University, was immediately struck by the map's details, particularly the fine lines that crisscrossed it. He recognized the document for what it was: a maritime trade chart from the Ming Dynasty. Today, the map represents a shift in our understanding of the roots of global trade. "This map will become world famous," Dr. Batchelor recalls telling the Bodleian's librarian after examining it. "It will appear in all history textbooks." The Selden Map, as it is known, is the oldest surviving merchant map of its kind. Donated to the Bodleian in 1659 by London collector John Selden, it has been the subject of several conferences, at least two books (including one by Dr. Batchelor), and nearly 50 scholarly papers in the West and in China since its rediscovery. Earlier this year, the map made its first foray out of the Bodleian in 350 years, traveling to Hong Kong where it is currently the star attraction of an exhibition at the city's maritime museum. "This is the most crucial discovery on the Ming Dynasty in a century," said Dr. Jiao Tianlong, the museum's chief curator and one of the world's leading experts on Ming trade history. Scholars from China have already made the trip to see it, with many more expected to attend a conference in Hong Kong on the map in early June. The 17th century Selden Map of China was once described as 'A very odd mapp of China. Very large, & taken from Mr. Selden's'. Today the map is one of the treasures of the Bodleian Library in the University of Oxford, and this film explores how the map is interpreted today by scholars from a range of different disciplines. The map's illustrations provide evidence of Ming China's strong seaborne economic and cultural ties with Southeast Asia and the Arab world. They also show the trade routes that connected China to Europe and the Americas. "This map tells the story of early globalization," noted Dr. Jiao. According to historian Timothy Brook, author of the international bestseller "Vermeer's Hat" and now of "Mr. Selden's Map of China," its existence rewrites "the textbook story" of how trade developed between Europe and China. The old story, Prof. Brook said, assumes that "the Europeans arrived and took things back; the Chinese are passive figures in this exchange." The map, however, suggests that "the Chinese were actively going out and carrying out the trade, doing the wholesaling." 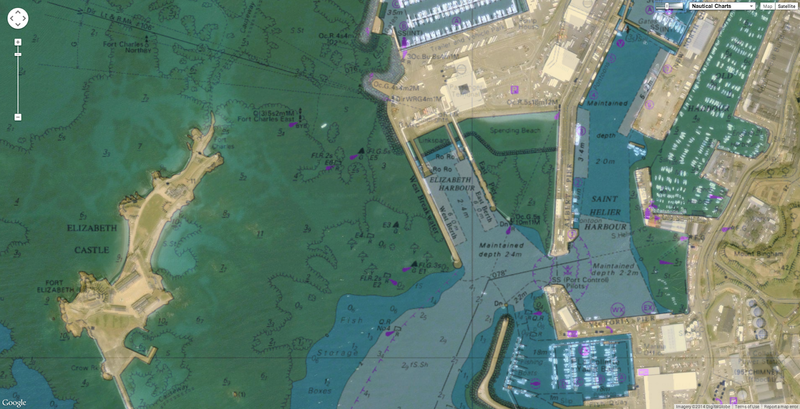 Merchant navigation charts are today a rarity. Imperial libraries considered commercial maps unworthy of scholarship, so few have been preserved. Yet these documents contain a trove of knowledge, especially about private business. "We are very keen for as many people—scholars and the general public—as possible to see the map," says Richard Ovenden, the Bodleian's librarian, on the decision to allow the item to leave Oxford. The hope is "for its visit to spark avenues of inquiry, questions and observations that have not emerged so far." Research on the map is just beginning, but it is believed to have been made sometime between 1566 and 1620, after the Emperor lifted a ban on trade with foreigners. An Arab or Arab-influenced cartographer likely made it for an influential Chinese trader based in or around Quanzhou, since most of the map's sailing routes originate from the port, a thriving international commercial center during the Ming Dynasty. The Selden Map is odd for its time because China occupies only a section, while the South China Sea takes up more than half of the intricate 158 cm by 96 cm surface. It accurately portrays Southeast Asia's geography, an area the cartographer had sophisticated knowledge of. Handpainted on paper in several colors, the map's borders place Siberia on top, Java and the "Spice Islands" in what is now Indonesia to the bottom, Burma and India to the west, and Japan and the Philippines to the east. Along the way, more than 60 trading ports are named in Chinese characters, dotted by a variety of botanical and topographical features rendered in classic Chinese landscape-painting style. Sailing directions to the Persian Gulf are in a corner. Shortly after the map became part of the Bodleian's collection, Latin and Chinese notations were added in ink by the then-librarian and a visiting Chinese scholar. Prof. Brook, who teaches at the University of British Columbia in Canada, has had rare access to the nautical chart, which is not usually on display at Oxford due to its delicate condition. Though the map has its own website featuring an interactive scan, he made several trips to the Bodleian to study it in person while writing his book. "I had a lot of questions. 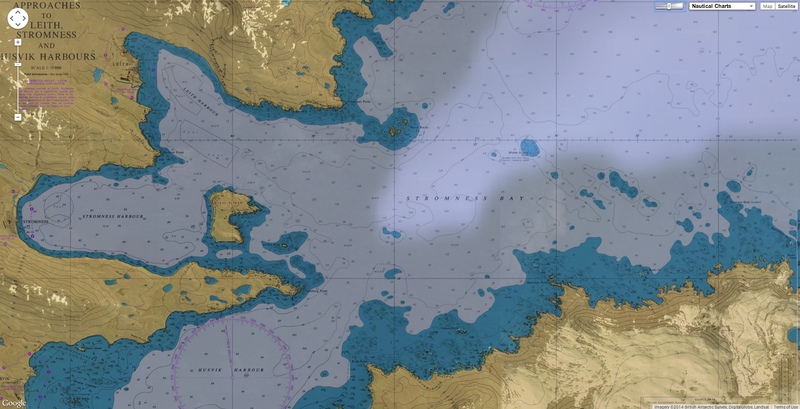 It is a fairly detailed map, with annotations. You need to look closely," Prof. Brook said. "There are details that you cannot see even with a high-resolution picture. Also you need to see what the plants and mountains look like. You need to soak it up, to feel it." Once British sailors were a big part of the whaling industry in the southern hemisphere. 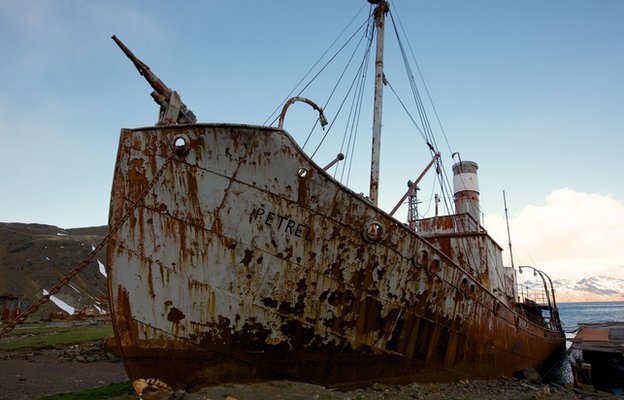 Now only rusting buildings and ship skeletons remain, where once thriving whaling stations were, writes Adam Nicholson. 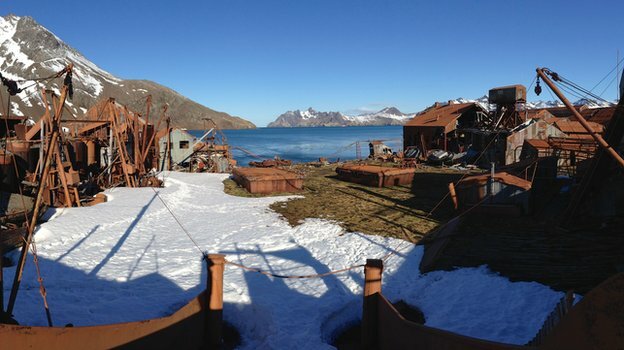 The abandoned whaling station at Leith Harbour on South Georgia in the south Atlantic looks as if it has been bombed. Rusty steel chimneys lie collapsed across the roadways. Power plants and dormitory blocks lie half-smashed, their innards spilling out through the walls - cast-iron beds and baths, piping and wiring, cushions and mattresses all now leaking into the freezing air. Some of the huge steel cylinders of the whale oil tanks, 30ft high and 30ft across, have had their sides folded in, as if by a giant hand. 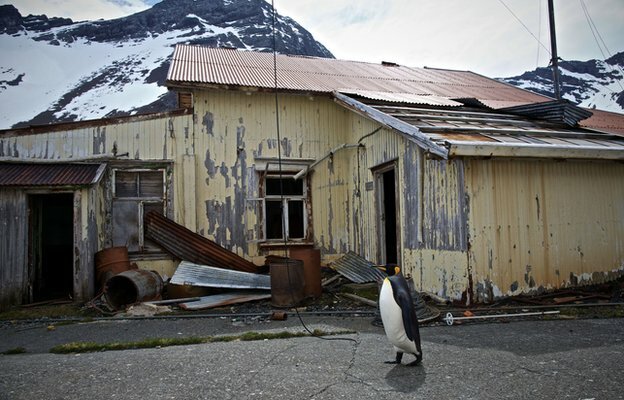 But these are just the effects of time and the brutal winds of the Southern Ocean. It is not somewhere you would ever like to be alone. 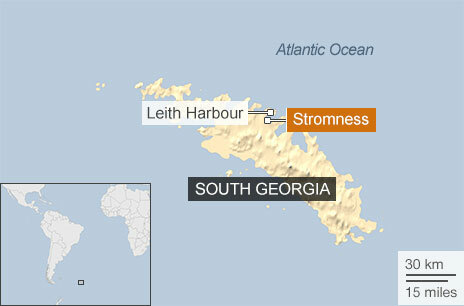 The winds that hurl off the mountains of this sub-Antarctic island, 800 miles east of the Falklands, on the same latitude as Cape Horn, make the whole place creak and groan. Rusted corrugated sheets screech against their fixings, doors slam open and shut, the ventilator cowls on the giant processor plants still turn in the wind as they have done since the place was finally abandoned and left to the elements in 1965. No-one is there now because Leith Harbour, like most of the other whaling stations on South Georgia, is strictly off-limits. The collapsing structures are too dangerous and the asbestos in which the whale processing machinery is still wrapped makes the enclosed places too toxic. The South Georgia government - this is one of Britain's few remaining overseas territories - had to give us permission to film in this breathtaking time-capsule of a forgotten way of British life. And we had to be accompanied by Tommy Moore, a Yorkshireman familiar with asbestos safety, and dressed in full protective gear. Pick your way through the buildings now and you find yourself in a forgotten world - mounds of harpoon heads lying rusted together, whale ribs and scapulae everywhere, abandoned tractors and rusted lathes. In the manager's villa, graffiti tells of Argentine joy in 1982 at recovering their own, every word of it covered with the unequivocal responses of the crews of Royal Navy ships who arrived a few weeks later. Snow clogs the doorways of the cinema where the whalers used to watch over and over again the few films they had, the dust-filled hall still filled with memories of Elizabeth Taylor and Deborah Kerr. The hospital still has unopened bottles of milk of magnesia and tins of Prickly Heat Powder on the shelves of its half-trashed pharmacy. Stinking fur seals lurk in the radio shack and among the overturned benches of the canteen. In the dormitories, the whalers' pin-ups still smile winsomely from the walls. Hidden in attic spaces you can find the bowls, ladles and tins of yeast with which the whalers made the fearsome hooch to console themselves on long winter evenings 8,000 miles from home. The whole place is a monument to a huge and massively destructive episode in British history. By the beginning of the 20th Century, whaling had virtually eliminated the stocks of whales in much of the northern hemisphere. Europe had a growing appetite for the oils that whales could provide - most of it for margarine and soap - and the vast stormy waters of the Southern Ocean beckoned, teeming with krill and with the whales that fed on it. Even by the beginning of the 19th century, whales were beginning to disappear from some coastal waters, and hunters had to travel further to make a living. In 1871, 32 vessels were lost when they became trapped in the arctic ice. Almost entirely fuelled by British finance, the whalers came south and embarked on a bonanza that lasted for two-thirds of the century. Individual whalers made the kind of money they could only have dreamed of at home. A young man returning to Shetland or the Hebrides in the 1950s after 18 months "at the ice" could buy a house, start a business or commission a fishing boat on his earnings. Christian Salvesen, the Edinburgh-based whaling company that built Leith Harbour, could hope in some years for 100% dividend on their investment. At the peak of the business in the 1920s, Salvesen's were making the equivalent £100m a year in profit in today's money. None of it was easily earned. Ice often clogged the rigging and individual catching boats were known to founder in the steep seas of the southern ocean. Earnings were dependent on the number of whales caught and the skipper-gunners drove boats and crews relentlessly. 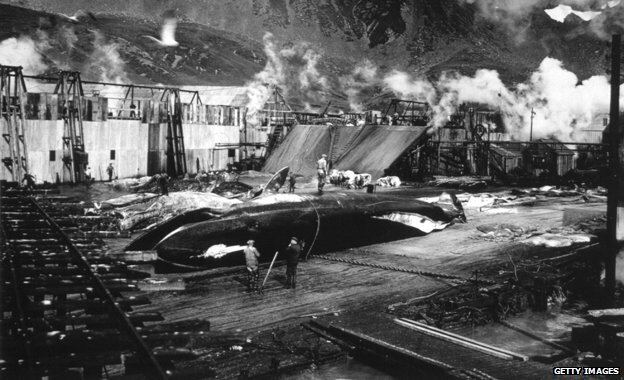 When the enormous bodies of the whales were hauled ashore into the huge processing plants, an army of men got to work, working 12-hour shifts, stripping the blubber from the carcasses, "like peeling a banana", as the whalers all say, shovelling the meat into the giant cookers, cutting up the bones with enormous steam saws and boiling them up for the oil they contained. An entire whale, the size of a railway carriage, could be disposed of in 20 minutes. If newly caught, there were consolations: "You could warm your hands in the fresh blood," Jock Murray, a whaler from the Hebrides remembers. "If it was a week old, that was something else." It is difficult to recover the frame of mind in which the destruction of so many of the greatest animals on earth seemed like a good idea. About 1.6 million whales were killed in the Southern Ocean in about six decades. The whalers remain deeply ambivalent about it today. Many say they are proud to have done it but wouldn't do it now. There are other ways, largely through plant extracts, of getting equivalents of the oils once taken from the whales. But, as one of the whalers, John Alexander, says: "We thought we were doing some good for the country." They were garnering fats which Britain desperately needed, particularly in the years after World War Two. It was a difficult task, at which they became immensely skilled. And as boys from crofts or fishing families in marginal parts of Scotland, they were providing for themselves in a way little else could have. Commodore Clipper arriving at St Helier harbour and berthing on the Elizabeth Harbour west berth. The World Oceans Day 2013 & 2014 theme is "Together we have the power to protect the ocean".